How do you inject a little bit of party panache into your child’s birthday celebration when you don’t have the time nor the talent to do it yourself? You turn to Etsy, of course. 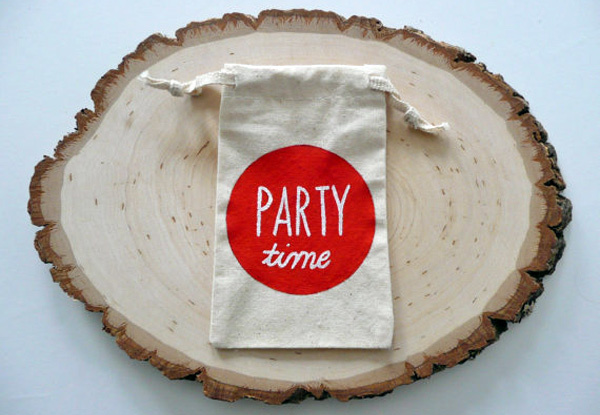 Here are our favourite party finds from Etsy guaranteed to add just the right handcrafted touch to your next birthday party. And shhhh, we won’t tell that you didn’t make it yourself! 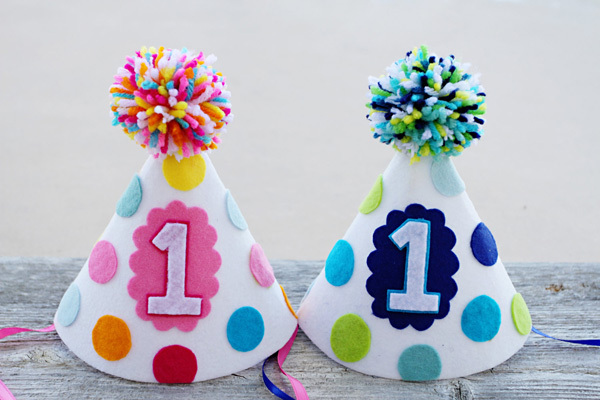 Party hats are a must, and we can’t help but be bowled over by these adorable personalised first birthday hats from La La Lola. Imagine the cuteness, imagine the memories, imagine the photos! La Lo Lola make hats sized just right for one-year-old heads in all sorts of other colours and patterns too priced from $20, as well as matching birthday banners and highchair decorations. This birthday banner is a must for garden parties or for stringing across the highchair of pretty high tea-style first birthdays. We also love it for the heirloom factor – pull it out for every future birthday and it becomes a treasured and very sentimental memento as your baby grows. 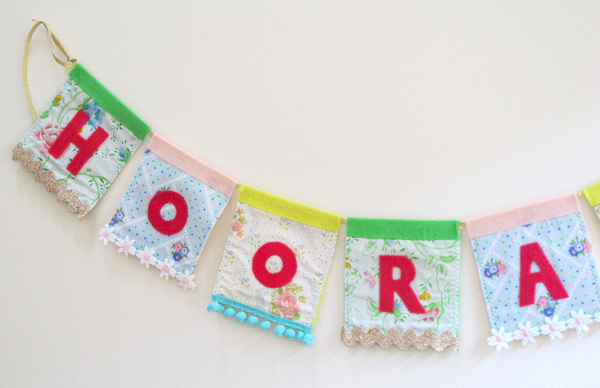 Made from vintage fabrics and all sorts of delightful trims, the Hooray banner costs $54 from Fun Cult. First birthdays are pretty special, so you’re going to want something fairly spectacular for the birthday kid to wear. 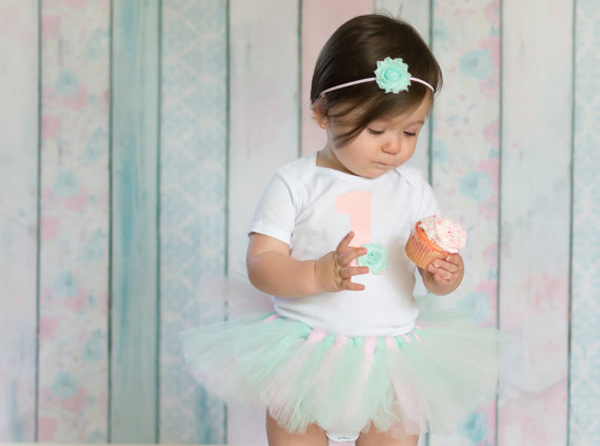 These rather sweet first birthday tutu sets (pictured above and top of post) from Belle & Whistle strike just the right balance between pretty party dress and sentimental keepsake for little girls. Available in a multitude of different colours, they cost $45 for the tutu, embroidered bodysuit and matching headband. Now for something smashing for baby boys – a cake smash outfit, to be precise. 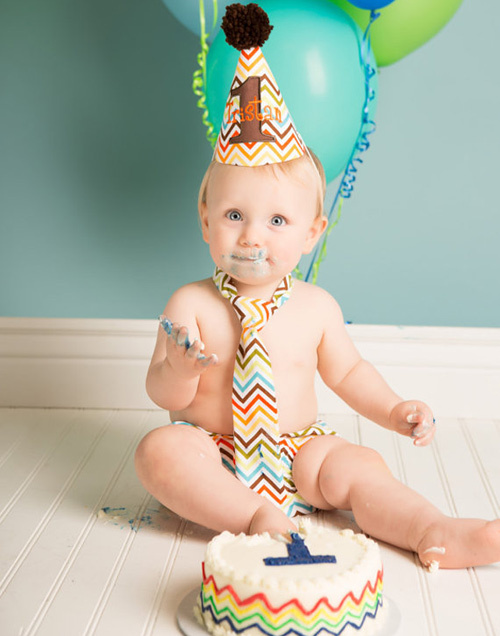 This hat, nappy cover and neck tie set in jaunty colourful chevron comes from Sprinkles of Love and costs $49. You may want a cake to smash, but don’t forget the other cake that everyone will want to share. Yes, the birthday cake is a pretty big deal come party time, so make it look the goods with a cake topper that catches the eye. This one, handmade from felt and cotton, certainly does the trick. It costs $40 from A Fate Beckons. Here’s another banner with a more rustic vibe. 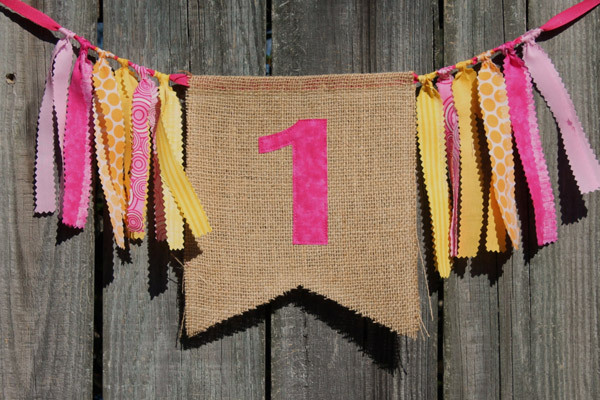 The burlap banner, with its pretty contrasting rag trim, can be made with any number you like, depending on which birthday you’re celebrating. Colours too are customisable to fit your party decor. It costs $14 from The Modern Daisy. 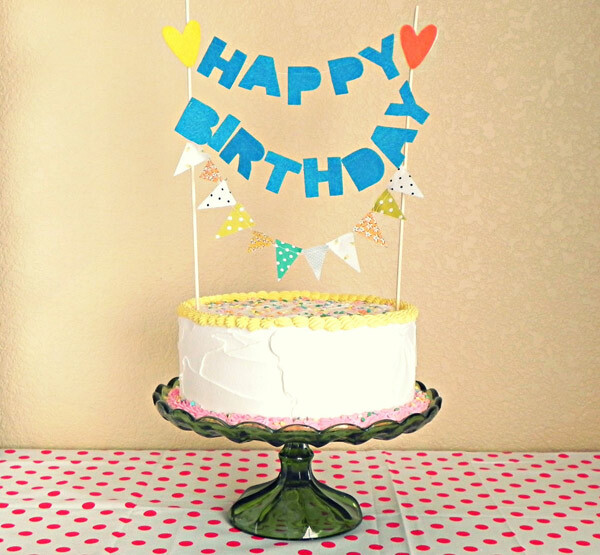 Bigger message banners – declaring happy birthday, names and the like – are also available. Or set the scene with an entire swag of printables. 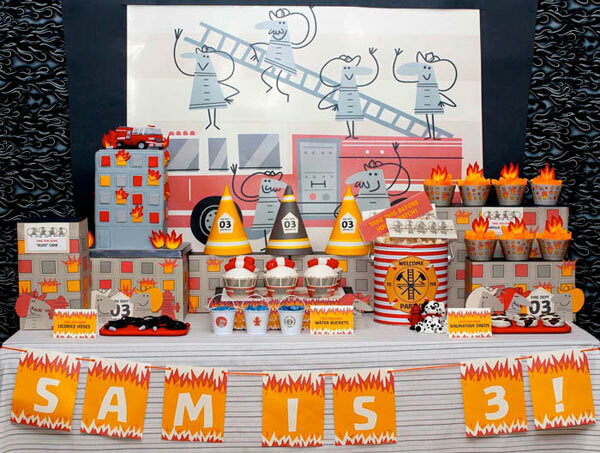 For little boys, it’s hard to go past a fire engine party – that’s what I’m planning for my own preschooler in a few short weeks – and your party will certainly look the goods with this fireman printable party package from Spaceships and Laser Beams. There is an absolute ton of other boy party themes in this Etsy store, so go crazy. Prices start from $5. 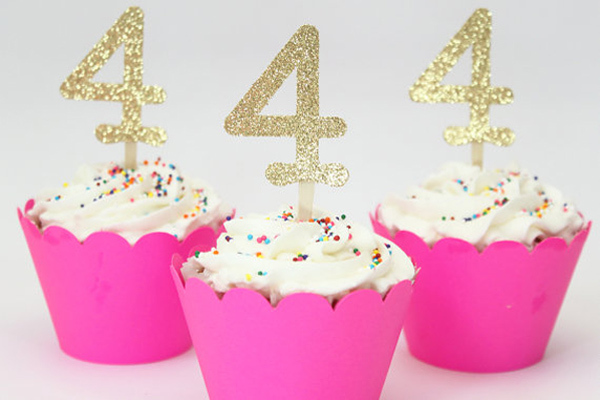 A bit of cupcake bling never goes astray and you can bling the bejeezus out of them with these gold glittery numeral cupcake toppers from When It Rains Paper Co.They come in any number combo you like and cost $14 for a set of 12. You can also pick up the neon cupcake wrappers here for $9 a dozen, or any number of other fabulous party supplies. Are birthdays the best day ever? You bet. So it makes perfect sense to whack the best birthday phrase ever on a balloon and plaster them all over your party space. Best day ever balloons are also pretty perfect for dropping into the take-home goody bags so guests can relive all the excitement when they get home. 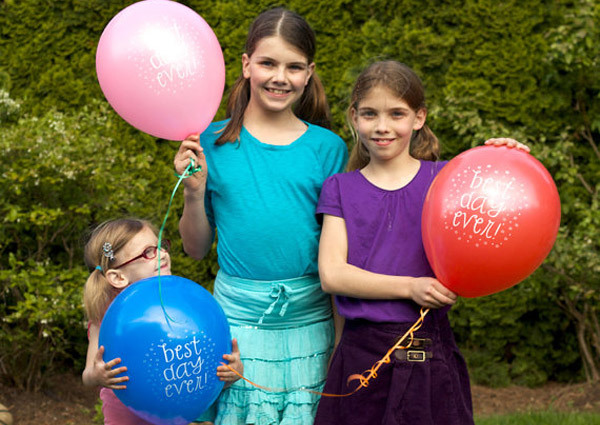 The best day ever party balloons cost $12 for six from Tickled Pink Paperie. Now for something to stash all those party treats in. I love the simplicity of these handprinted mini calico treat bags from Tiny Brushstrokes. Only $3.60 a piece, they’re big enough to hold three Matchbox-sized cars, a toy train, a bunch of mini animals, a dozen crayons or a handful of lollies – all perfect take-home treats for a toddler party. 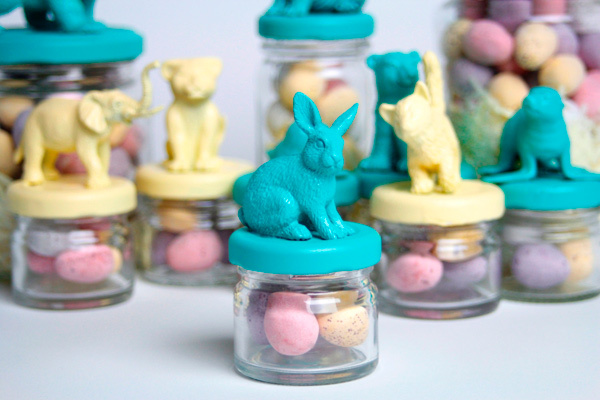 If quirky is your thing, and farm, woodland, zoo or forest your party theme, then these handmade animal jars should definitely be on your birthday essentials list. Sized just right for a toddler or preschool-sized serving of sweets, each jar costs $6 from Rupert’s House. Of course, sometimes you just don’t have time to track down all those fun little treats to go in your party bags. No matter, we have the answer. 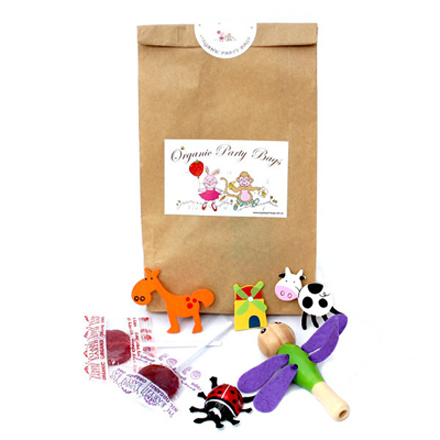 It’s Organic Party Bags. I really love the concept of these bags, filled with little organic toys and low-sugar treats so the kids don’t bounce off the walls once they get home. The bags come pre-packed and ready to give out at the end of your party for $3.50 a piece. Here’s something that’s fast becoming a trend for first birthdays – the my favourite things board, where you display all the birthday child’s favourite things – books, games, foods and the like – for guests to coo over. There’s a whole flotilla of ‘my favourite’ poster boards going on Etsy, but we like these ones from Moulage Collection. 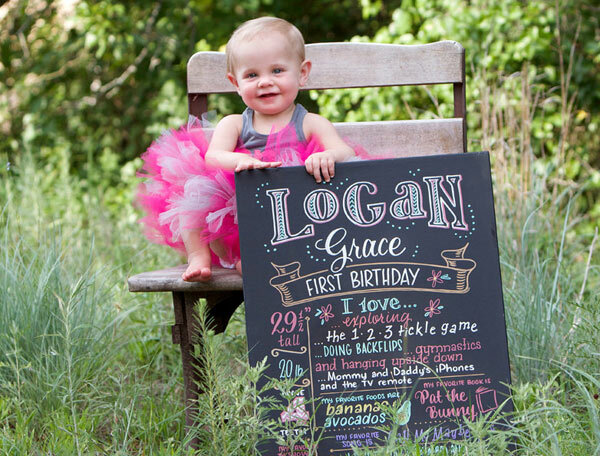 Printed in ink on either stretched canvas or art board, these ‘chalkboards’ can’t be rubbed out and make beautiful keepsakes from a very special day. Large posters start from $65 plus shipping. Little glass bottles with paper straws look good on the party table, it’s true, but I’m always nervous about the potential for disaster when there’s little kids involved. 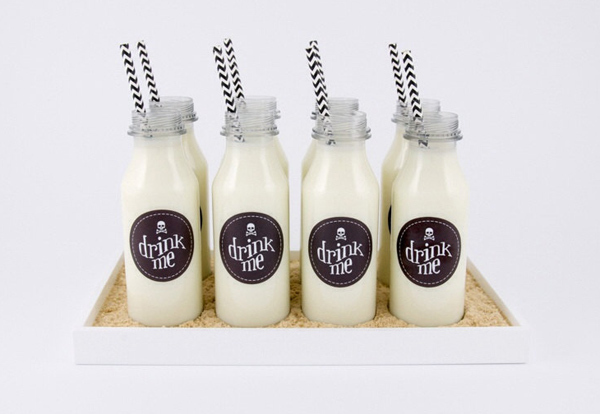 Get the look without the danger with these plastic milk bottles. Bottles come in sets of eight for $18, including your choice of decorative vinyl label, from The Party Ship. 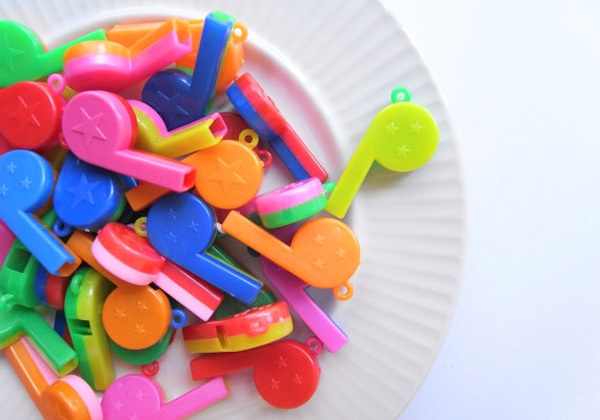 We normally eschew most plastic toys here at Babyology but these little whistles are totes toot-sweet. Parties are all about making as much noise as possible, after all, so imagine the fun bigger kids will have with these. Plus, they’re super cheap – only $2 for 12 and a couple of extra dollars for shipping. Happiness Garden have plenty more fun favours too. Finally, here’s a DIY happy birthday bunting suitable for a boy or girl that you can easily whip up at home. 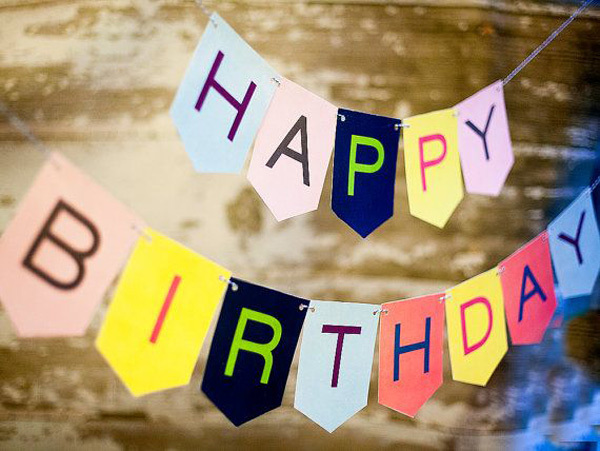 Just print, cut, thread onto twine and – voila – one fun, reuseable birthday banner. The digital file will set you back a mere $5 from Less Ordinary Designs. Happy Etsy birthdays, everyone!